Heart Unbroken is one of few books that put tears in my eyes. This is a story I wanted to write for a long time but was afraid to. Then Juliette Duncan invited me to join The Potter’s House Books series (at the moment of this writing, The Homecoming by Juliette Duncan, Book 1 in this series, is #1 Best Seller in Inspirational Religious Fiction). I was honored to become part of this amazing multi-author project with faith-filled books about hope, love, redemption, and second chances. And I realized that Heart Unbroken embodied all that. It gave me courage. Why was I afraid to write it? You see, I never shy from real life in my books. However, most of my Christian romances are sweet and heartwarming and the heroines, while far from perfect, are kind and caring. Heart Unbroken is sweet and heartwarming, as well, but it’s very emotional and deals with a difficult issue, drug addiction. The heroine, Emma, is flawed, heartbroken, and desperately tries to change her life and regain trust of her son after accepting Christ. She’s kind and caring, yes, but she’d made many mistakes during her former addiction, including walking away from her husband and her little boy. I wasn’t sure readers would be able to forgive her. She certainly can’t forgive herself. It actually surprised me that several readers asked me for Emma’s story (she appeared in one of my previous books as a secondary character). I love Christian romances, both books that make me laugh and books that deal with the issues that make me want to cry. There are several Christian romances where the heroine deals with drug addiction (Wisdom to Know by Elizabeth Maddrey, for example), but frankly I found very few of them. That made me worry if I’m pushing the envelope too far. But then, I hear often about people whose neighbor’s son or friend’s daughter succumbed to addiction. Those parents suffer, and suffer a lot. I decided this story needed to be told, with hope, encouragement, and yes, a happy ending. God’s mercy is limitless. He loves us, no matter how many mistakes we make. So in my heart, I felt this book had to be written. It was difficult and was nearly tearing me apart sometimes as Emma’s pain squeezed my heart. In the end, she was ready to pay the ultimate price for her son’s life. She learned to love and live again. I hope so much that this book will touch readers’ hearts. Heart Unbroken is available for pre-order for 99 cents (limited time) and is scheduled to release on April 24th. How much real life do you like in your Christian romances? Are you okay with flawed characters who strive to become better? I’m happy to offer a giveaway. One randomly chosen commenter to this post will receive an ARC of Heart Unbroken via BookFunnel. The giveaway is open until 9 p.m. on April 12th. P.S. If you’d like to learn more about The Potter’s House Books series, please visit the Amazon page here and the website here. Alexa, this sounds like a difficult story for you to write. I will definitely be getting this when it comes out! Thank you so much, Paula Dye! It was probably the most emotional story I’ve ever written in so many senses! I really hope you’ll enjoy reading it. Hi Alexa! Thanks for an insightful post. We are all sinners saved by grace, so I prefer reading about flawed characters that strive to do better. More realistic to real life. Also reading book reviews often a criticism (by I presume non-believers) is the character is goody two shoes or too perfect. Having friends whose children passed way to young because of opioids, your story is spot on. Addiction is a growing problem. Your book is preordered. Blessings and Happy Writing. Hi Renate! Thank you so much for your kind words and for pre-ordering my new book! My heart goes out to your friends. I can only imagine the pain they experienced. Yes, sadly, addiction is a growing problem. Thank you so much for all your support! I like to read a mix of books. I like the majority to be on the lighter, take-me-away-from-reality kind, but I also like to be swept up into a more serious book every now and then. Some of the most memorable books I’ve read have been the ones dealing with serious, real-life hard issues. Hello Elizabeth! I can totally relate. I like to read lighter books sometimes. And sometimes I read more in-deoth books. And so true! Those in-depth books are often the ones are remember for the rest of my life! Thank you very much for commenting! Wow, I want to read this next right now! Addiction is such a heartbreaking struggle! Hello Susan Dyer! I couldn’t agree more. Addiction is such a heartbreaking struggle, for everybody involved, including friends and family. And I’m so glad you already want to read my new book! Thank you very much for your kind words, Kim Hansen! I like real life, but I don’t like focusing on sin. But we all struggle with a pet sin, which could be called an addiction. This is intriguing to me. Thanks for the opportunity for the giveaway. Hello Lila Diller! I’m glad my new book sounds intriguing to you! And it’s my pleasure to offer a giveaway to Inspy Romance readers. Thank you very much for commenting! Wow. Such a deep topic. Most people would think that Christian finances are cheesy, but adding something like drug addiction I think is perfect. It allows us as Christians to step back and see things from other people’s point of view, while enjoying clean romance novels. I just want to say thank you for writing something I don’t feel guilty about reading. I love when I find good romances centered around God’s unfailing love for His people. Thank you!!! Hello Britney! I’m so grateful for your comment! It’s words like yours that encourage us, authors, and help us continue to do what we’re doing. And yes, I agree, sometimes people have a misconception about Christian romances. We do write about people who struggle with real life issues, but in God-honoring way. It’s a priviledge to write books like that, and I don’t take it lightly. I’m so grateful for readers like you! 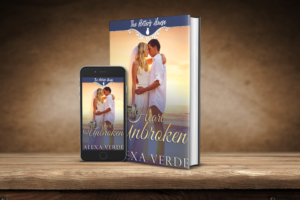 I am really looking forward to reading Heart Unbroken, Alexa! Personally, books with flawed characters are my favorite–that’s what I write! I love watching God redeem the seemingly unredeemable! I’m also grateful to be part of the Potter’s House Series and I can’t wait to read every book! Brenda, thank you very much! And your books sound amazing! I look forward to your book being next. And same here, I’m so grateful to be part of The Potter’s House Books series. I love books that deal with tough subjects, though as Elizabeth stated above, I can’t read just that type. So many people in this world are hurting due to one thing or another and seeing a problem they are dealing with in Christian Fiction won’t necessarily fix the problem, but it will give them courage to know others struggle with the same thing. Even Christians put on a mask so others really don’t know them, or they just avoid everyone as much as possible. Hello Andrea Byers! I think there should be a mix of different types of books for people to choose. I loved what you said about people getting courage from reading in Christian Fiction about the problem they struggle with. There’s so much pain and suffering in this world, and we want so badly to bring our readers hope and encouragement. Thank you very much for commenting! I love heartwarming, sweet books and have a really hard time connectomg with characters when books are too close to hard lived reality. Not that there aren’t a lot of people with addictions (of all kinds) out there, but it feels more like women’s fiction or drama than romance. I can see why you worry readers would be able to forgive your heroine, because it’s definitely hard (like your example of Elizabeth’s Wisdom to Know). Perhaps it’s not so much hard to forgive, but hard to connect with the character? Hello Priscila! I totally understand. There are times when I only want to read sweet books. Yes, that was my concern, too, for the reader to be able to connect with my heroine. You said it very well. I did my best to show how much my heroine changed and how much she regrets her mistakes. She’s even willing to give her life for her son! But yes, the concern and worry was there. Thank you very much for commenting! Thanks for the mention, Alexa! I love the hard hitting books – I’ll definitely be picking yours up! Thank you so much, Elizabeth! I enjoyed reading Wisdom to Know. It was very refreshing. I think we need more books that deal with tough issues! Hi Alexa, I will be pre-ordering your book. I like the idea that a sheriff and a former addict would fall for each other. He would understand where she is coming from and can be more understanding to the struggles she has had in her life. His side of the story of the story would help the readers deal with what the former addict had gone through. I like to read both the lighter inspirational romances and inspirational romances that have a little more depth to them. Looking forward to reading the book when it releases later this month. Hello Nancy! You made my day! Thank you so much for your support of a new book. Yes, despite circumstances, he wants to help her. And looks like we have similar tastes in reading! I like to read both lighter romances and more in-depth romances. And this story just called to me! Thank you for commenting! Sounds like Hearts Unbroken is not the typical boy meets girl with mediocre conflict. I like a book that brings in the realities of like. It makes the characters and storyline more believable. I love when a book literally pulls out all your emotions. Hello Colleen! True, it’s not a typical boy meets girl romance. And while I tried to build up emotions gradually, my throat still closes up when I think about the scene right before the ending. Thank you for commenting! I can’t wait to read this book. I love stories that are real and raw, and shows the difference Jesus makes in a life. This sounds just like that! Wow, Hannah Corner! You just put a huge smile on my face! Yes, exactly, I wanted to show that our Lord gives us second, third, even fourth chances! How different, how much better we can become if we follow Jesus without looking at our past! Thank you so much for commenting. This sounds like a fascinating read. I really appreciate nitty-gritty Christian fiction that tells it like the real world in which we live & strive to follow Christ. Thanks for tackling this prevalent issue of our day! Thank you, Susan Zollman! Your words mean so much to me! I can’t say enough how much I’m encouraged and uplifted by all these wonderful comments. Hugely appreciated! I enjoy books about ordinary people with problems. I don’t enjoy reading about perfect people because I’ve never met one. Hello Mary Kennemer! I’m so glad to hear it. I don’t like reading about perfect characters, either, because frankly, I find it difficult to relate to them. I’m so far from perfect! Thank you so much for commenting and your support. So well said, Autumn! I couldn’t agree more! And huge thanks for your support! I can’t wait to read this, Alexa. You’re so sweet, Marion! I look forward to the release of your book in the series, too! Can’t wait to read it! I’m so looking forward to reading Emma’s story. Everyone deserves a 2nd chance, and seeing God’s loving hand at work in her life will be exciting and uplifting. Another great addition The Potter’s House Books! Thank you so much, Juliette! And huge thanks for organizing The Potter’s House Books series! I’m truly honored to be part of it. Books with difficult subject are always harder to write. I think it requires the author to dig deeper into their own emotions to put the emotions of the character into the story. I’m glad you decided to write your book, Alexa. I have a story, Second Chance Reunion, in which the heroine is just coming out of rehab as the book begins. She has lost her children and everything else she found important. She has a lot of bridge building to do, especially with her ex-husband. Thank you, Merrillee! Yes, writing a more emotional book means digging deeper into your own emotions, and it’s so much more difficult. In fact, it can be heartwrenching! Your book sounds very interesting and like something I’d like to read. I love 2nd chance stories. Our oldest son who will soon be 36, is an addict. He is a believer but is still struggling with it and the consequences of his past, one of which he has no contact with his daughter. We know God can deliver but he has to make the choice. So yes I love the stories of hope in our flawed life. God is that Hope! Hello Judy Burdett! I’m so sorry to hear about your oldest son. I can only imagine how painful it must have been for you and your family. I appreciate you sharing. I hope it’s okay with you if I say a prayer for you, your son, and his daughter. Thank you so much, Ann Ellison! You’re such a great support to Christian authors! Thank you, Sherri! It totally makes about reading different books depending on the frame of mind you’re in. Sometimes it’s the same for me. It also depends on the stage of life I am in. And yes, it was a great observation! I’ve read so many books where drug addicts are negative characters who are judged harshly, but so few books that take a closer look at them. Thank you so much for sharing! I am sure it is needed…today more than ever. My daughter was a drug addict and had her daughter removed from my CPS. Today she has been delivered and is a very strong Christian. Her daughter is now married with her own children but still very angry and not saved yet! It was a long hard struggle for me as I was dealing with her and an adulterous husband, a divorce, and a remarriage! Keep writing from your heart. There is always someone who needs it! Hello Helen! Thank you so much for your thoughtful and heartfelt words! I’m so sorry about what happened to you daughter and how it had affected and still affecting your entire family. It’s truly heartwrenching what you have gone through. I’m glad your daughter is a strong Christian now, and I’ll pray for her daughter. And yes, you said it well. I write from my heart. Once again, thank you so much! I’m so grateful for all readers’ support! Bev, you’re amazing! I read your comment so many times, and it spoke to my heart. I’m so grateful for all you’ve said! 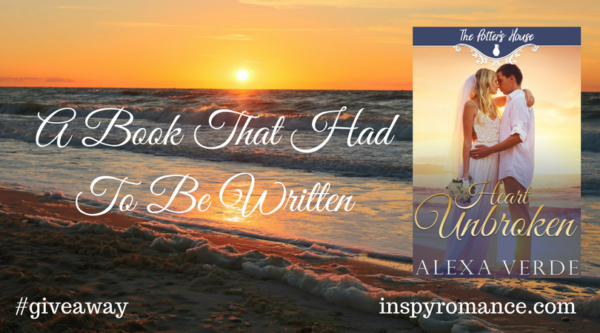 Flawed broken characters who reflect real life’s heartaches make for good reading. Thank you so much! I think so, too, and this exactly describes my heroine in Heart Unbroken. I’m so thankful for all these wonderful comments! Janie, huge thanks for pre-ordering Heart Unbroken! I like books that deal with real life, Alexa. This sounds good. Thank you very much, Shannon Taylor Vannatter! It’s so encouraging to read all these comments. The Potter’s House serie sounds very interesting ! I just read the first book, of Duncan, love it. I’m sure your book will be goo too, with uncommon characters a big trust and hope in people and God. Hello Marta! So happy to see you here! Huge thanks for being such a wonderful supporter!